Welcome to the first installment of 1000 WORDS WITH; our new online Q&A series featuring icons, influencers and cultural movers and shakers, who also happen to be ATW customers. We christen our first piece with a Wisconsin native who personifies good ol’ fashion hustle. He’s a bonafide Hip-Hop head; devout family man; and designer of funky footwear at a shoe company you might’ve heard of. His name is Tony Hardman; and if that name doesn’t ring a bell, that’s unimportant. What is important is that he designs fly and functional kicks that enhance your athletic performance and keep you, your homie and your favorite NBA player’s sneaker game lit. Enjoy the vibes! ATW: Thanks for making time to speak with us, Tony. Please tell us what you do for a living and how you got started. TH: The pleasure is all mine! As you know, I’m a huge fan of the ATW brand, so I’m honored to be a part of it. 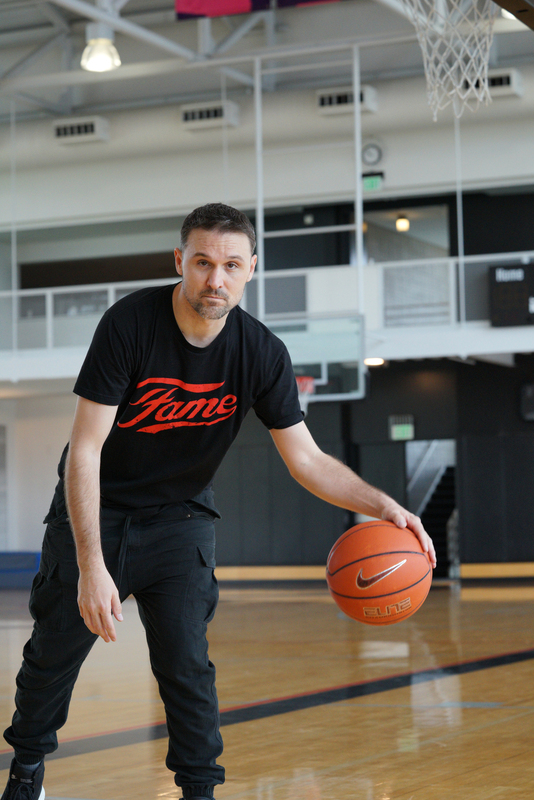 I’ve been designing footwear at Nike for the last 7 years, with the last 5 specifically in the basketball category. Honestly, it was a dream come true that started way back for me. In my high school days, like early 90’s, I was a crazy Jordan fan. The Come Fly With Me tape changed my life, and I remember the first time I saw this cat in the hall wearing the black AJ V’s; I just stopped him and was stooped over checking out his kicks. Big reflective tongue; Clear rubber outsole; the rubber netting on the side with the silver flames. It was the first time that I had that revelation about how design really has the power to move people. And I think from that point forward I wanted to design kicks because it was just the perfect blend of art and basketball, the 2 things I loved most. ATW: Your portfolio boasts nearly 30 pairs of basketball shoes with athletes such as LeBron James, Kevin Durant and most recently, Paul George, with the release of his first signature model, the PG 1. 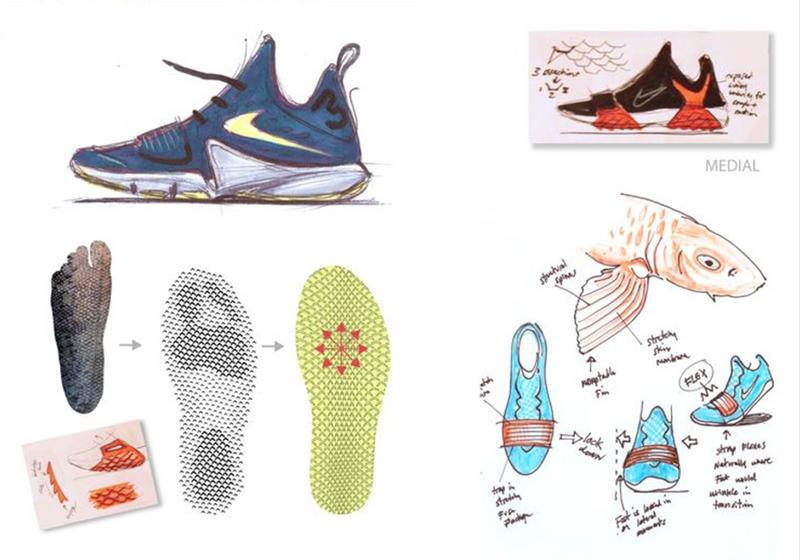 Walk us through creating a shoe for an NBA star, including player input and creative compromises. TH: Working with the athlete directly is really the pinnacle of what we do. It gives us a chance to hopefully make them better at what they do and create something that expresses their personal style in a way that not many brands can do. With Paul, for example, we kicked the process off with him at his home in Indy. We took a day and chopped it up about sneakers, what he liked and didn’t like, went through his closet and just got to know who he was as a person. As you might know, he suffered a nasty leg injury that kept him out of the game for about a year, so the entire process for the shoe was almost 3 years. Typically it takes about 18 months to 2 years. So he was super involved and it gave us a chance to really include him in the process; from napkin sketches to final concept. We definitely had a few things that we didn’t necessarily agree on along the way, but I like to keep the process organic and ultimately we tried to give him what HE wanted. That’s the whole point of making a signature. At the same time, that input varies from project to project. There are instances where we have to kind of take what we know about a player and execute without specific feedback along the way. It just depends. ATW: As a designer myself, I know how cool and rewarding it is to see someone, especially someone famous, rockin’ your work. How do you feel when see someone (famous or not) in a pair of shoes you designed? TH: Oh man, it’s amazing! That feeling never gets old. Even if it’s a 60 year-old lady you see at the bus stop or something, it’s always cool to think “out of all the shoes to choose from in the world, this person felt some kind of connection to my work.” The other thing I love about designing for the game of basketball in particular is that those kicks become immortalized through some of the biggest and most exciting moments in sports history. It’s hard to even fathom. ATW: We’re happy to call one of Nike’s finest designers a loyal ATW customer. How did you find out about us and what are you most happy with regarding our product, and brand overall? TH: What I love most about ATW is that it’s authentic to the culture. A lot of brands feel like cash-grab Hip-Hop exploitation level stuff. With ATW it’s more of a tribute to the original artists and moments that made Hip-Hop what it is. It connects with the older generation that lived through those times in a real way but also feels like a way to teach the new generation where all of this creative brilliance came from. From an actual product standpoint, there’s no corners cut on the craftsmanship, materials or design. I think that’s what brings me back. I’m still rockin’ the OG tees that I copped a while back and they all look and fit damn near like new. You can’t find that level of quality very often these days. ATW: People collect great tees like they collect great kicks. In your opinion, what makes apparel and footwear so collectible, and what role does design play in this? TH: I think what we wear is the greatest expression of who we are before anyone hears us speak. So to have a product that really speaks to someone and allow them to express themselves is a powerful thing. Design is obviously super important as it determines what that expression is. ATW: Which one of yours shoes are you most proud of, and why? TH: I can definitely say the PG 1 is one of my favorites. It really reflects Paul’s personality, and he’s such an amazing person. I did a low top called the Hyperchase a few years ago that I loved just because it was simple and modern, but still had great character in my eyes. The simplest ones are always the hardest! ATW: The pleasure was all ours, Tony. Any parting words or upcoming projects you’d like to share? TH: Thanks for having me! Def be on the lookout for the next few evolutions of PG’s line. There are some other really cool things on the way that obviously I can't share yet, but definitely excited to share them with the world. Looking forward to the latest from ATW as well! Photos courtesy of Tony Hardman and Nike. All rights reserved. Photos Top to Bottom: Nike footwear designer, Tony Hardman. Before the magic: Nike Zoom Live sketches by Tony Hardman. Nike PG 1 design elements by Tony Hardman. Tony handling the rock in our throwback 'Fame' tee. Paul George ad for the Nike “Ivory” PG 1.